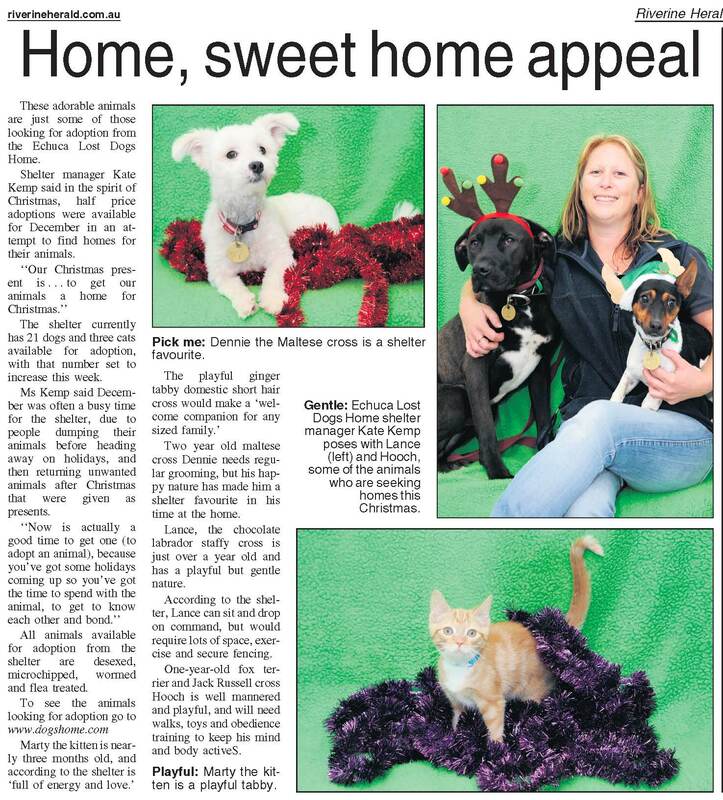 The Lost Dogs’ Home Campaspe shelter received some much-deserved attention this week, when four of our beautiful residents were featured in the local Echuca paper, The Riverine Herald. Maltese cross Dennis, chocolate Lab cross Lance, little Marty the kitten and Hooch, the Jack Russell cross donned Santa hats and tinsel and struck their best pose in the hopes of finding a home. Shelter Manager Kate Kemp also got in on the act, saying her only Christmas wish would be for all 21 cats and dogs currently at the shelter to find new homes. With more cats and dogs due to arrive at the shelter over the busy Christmas and New Year period, Kate and her team are hoping the article will highlight how many animals are in need of a loving family.